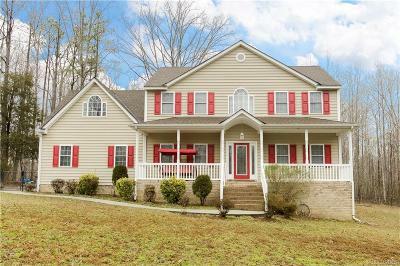 Don't miss the opportunity to own a like NEW 4 bedroom Colonial located on over 1.6 acre lot in the Heart of Prince George County just off 460 and only minutes to Fort Lee Mahone Gate. This two story boast 4 spacious bedrooms. 2.5 bathrooms, a large eat-in kitchen, cozy family room with a gas fireplace, formal living/Office, Formal Dining with room with chair rail, crown molding and wainscoting. The exterior is just as amazing with a large country front porch, large back deck, Newer fencing that you must see to appreciate. Directions: From Fort Lee Mahone Gate Make A Left On 460 Heading East The Home Is Couple Miles Down On The Left.